This is the ultimate LED Strip, at 60 5050 LEDs per meter it's the brightest RGB LED strip available. This strip also comes with an advanced 44 key remote control with more modes and color selection than ever before. The strip uses a super charged power adapter (12V, 6A) for extra bright, extra crisp colors!. This SMD strip (Surface Mount LED) is completely flexible, you can twist it into any shape. LED strips offer creative options for upgrading the lighting of any room. Our LED strips can be used to set the mood in bedrooms, living rooms, conference rooms and office reception area. It’s also the coolest way to decorate any vehicle, bar and display counter. Our LED strips are self adhesive and connect with simple plug and play connectors. They are great for creating the perfect lighting for everyday living to party lighting. 1-5 meter 300LEDs 5050 Super RGB Flash SMD LED. 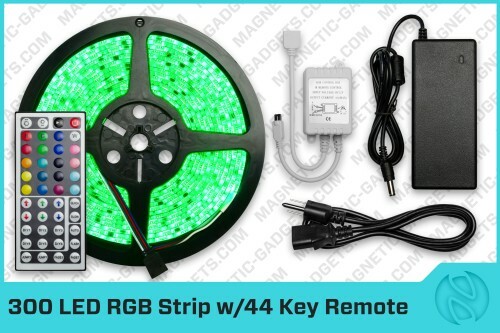 Keep in mind that the 300 LED strip includes twice as many LEDs and comes with a 44 key remote which has more colors and more modes.